The new Nikon Teleconverter TC-14E III delivers the speed, performance and lightness that far surpasses its predecessor. It is well worth upgrading the TC-14E 11 and a no-brainer upgrade if you have the original TC-14E. 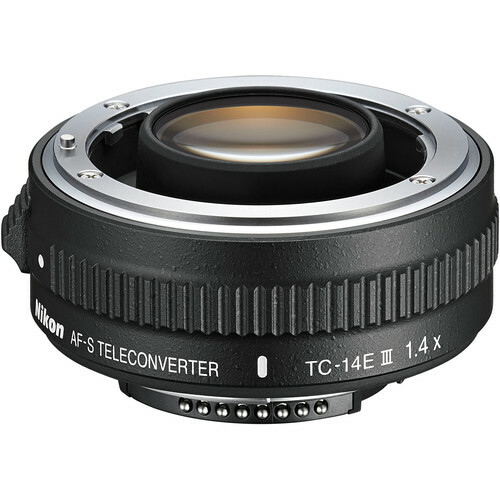 The Teleconverter TC-14E III increases the reach of compatible AF-S NIKKOR lenses by 40 percent with only a 1-stop loss of light. “Employing a new optical design that maximizes the optical performance of a prime lens to the limit, this teleconverter realizes superb depiction closer to that of the prime lens as well as enhanced AF accuracy,” Nikon said. Photographers generally have mixed opinions about teleconverters that sacrifice more than 1 stop of light. Some teleconverters reduce the accuracy of the autofocus and can slow down the image capture rate creating issues for fast action sports photographers. As Nikon improved its line of teleconverters, some of the negative side effects may be more imagined or historical wise tales then not, but there is always a loss of light and some loss of sharpness when using a teleconverter. The 14E has always had a reputation among photographers as the only teleconverter with acceptable losses. The new 14E 111 is by far the best teleconverter Nikon has ever made. Without having performed a scientific test, it appears that the new TC-14E 111 may slay the dragon of conventional wisdom about the negative effects of teleconverters. Nikon also provides a compatibility chart that shows the limitations (if any) with their lenses. Given that it can dramatically increase the reach of your lens, with very minimal image degradation, the Nikon Teleconverter TC-14E III is a relative bargain at under $500. It is currently available on Amazon.com for $496.95 (with free Prime shipping).